Strangers can become family, one by one by one. builds bridges of trust to promote peace. and action relevant for every human being everywhere. ARK (Architects Relationships Knowledge) is an international youth group that believes in and works to achieve global peace. ARK began in 2001 with a small group of concerned adults who insisted that peace needed to start with young people, the hope for the future. In November 2003, after much planning, youth and adults gathered for the first ARK Summit in San Lucas Toliman, Guatemala. Young people from three countries – Guatemala, Palestine and United States – interacted patiently, stumbled and laughed through language translations to discover respect for our cultural and faith diversities. They delved into tough subjects like poverty, oppression, racism, human rights and powerlessness. Through that struggle, they began to bond as a global family. Now, after seven successful two-week summits, the original three countries of Guatemala, Palestine and the US now includes participants from Iran, Malawi, Lithuania and Pakistan. ARK has become a Global Family aware of the importance of sustainable goals that are important to each of their countries. They have bonded to care about one another even as they return to their homelands to implement goals to build a better world for all people. A mouthful, to be sure, but nonetheless, a commitment made with integrity and energy as they move in AGENDA 2017 AND BEYOND to shape the WORLD THEY WANT for themselves and future generations: GO TOGETHER 2019. – Jason Capecchi, student,George Town University, Washington D.C. 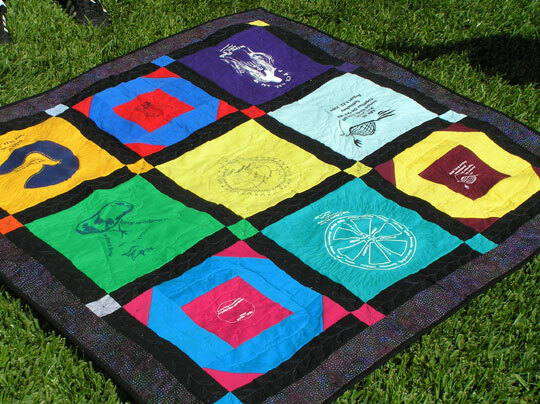 This quilt was created and made for ARK by Kathy Dobovsky of Minneapolis. It celebrates the first five ARK summits.